ST. LOUIS, MO--(Marketwired - March 01, 2016) - Many people are not aware that soft drinks -- even diet soft drinks, sports and energy drinks, and fruit drinks -- contain acids, which can be especially troublesome for people in orthodontic treatment. The American Association of Orthodontists (AAO) strongly advises patients in orthodontic treatment to avoid drinks with low pH levels because the lower the pH level, the more acidic the beverage. A new AAO educational flier, Soft Drinks + Orthodontic Treatment = A Recipe for Disaster, lists pH levels of more than 30 soft drinks, including sports and energy drinks, fruit juices, and regular and diet soda pop. "It's tempting to reach for soft drinks. People around us drink them regularly, they are easily purchased in vending machines and at convenience stores, and many are heavily advertised," says Morris N. Poole, DDS, president of the AAO. "Sugar is known to be bad for the teeth, but sugar-free soft drinks present dangers, as well. "Consumption of soft drinks during orthodontic treatment puts teeth at risk of decay due to the acid attack on enamel," says Dr. Poole. He hopes a closer look at the science of decay might make that next soft drink a little less appealing. "The acid in soft drinks pulls calcium out of tooth enamel. Repeatedly bathing teeth with acidic soft drinks dissolves enamel, and is a sure path to a cavity. If soft drinks contain sugar, the risk increases. 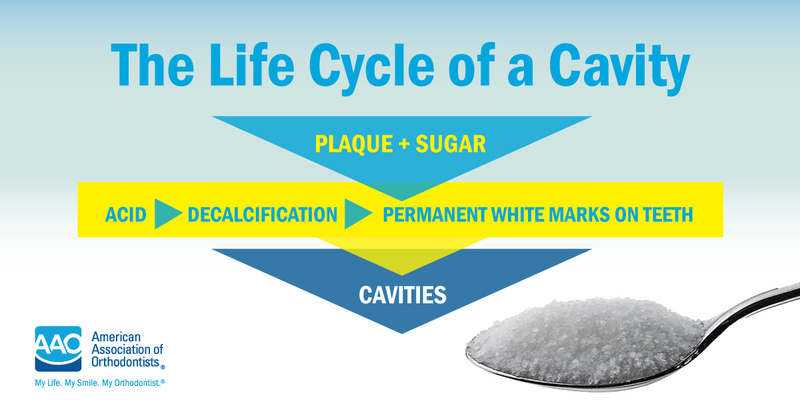 Sugar interacts with plaque and forms yet another acid to further dissolve enamel. When enamel is gone, the loss is permanent." Dr. Poole notes that water is an excellent drink of choice, especially for orthodontic patients. Water, unlike soft drinks, has no impact on tooth decay. As illustrated in Soft Drinks + Orthodontic Treatment = A Recipe for Disaster, a wide variety of soft drinks are potentially harmful to tooth enamel. "I like to tell patients that a single sip of a soft drink is the catalyst for an attack on tooth enamel, and the attack is renewed with each new sip," says Dr. Poole. These "attacks" can leave white spots or lines on teeth. The portion of a tooth covered by a bracket is protected, but damage around the perimeter of the bracket can leave the tooth with a permanent outline of where the bracket had been. "This is a huge disappointment to patients and their orthodontists," says Dr. Poole, and, he notes, is one of the reasons that orthodontists insist that patients brush and floss as recommended. "It just makes sense that acidic drinks can't be good for your teeth, let alone your overall health." Always follow their orthodontist's instructions on oral hygiene (brushing, flossing and regular professional cleanings). A little extra diligence goes a long way toward reaching the goal of orthodontic treatment: a healthy, beautiful smile. Brush right away after consuming soft drinks, including sports and energy drinks, fruit juices, and regular and diet soda pop. If you can't brush right away, at least rinse with water. "Realistically, we recognize that patients may indulge in soft drinks from time to time," says Dr. Poole. "While we don't begrudge anyone the occasional sweet treat, it is imperative that for good oral health, the indulgence is immediately followed by thorough brushing and flossing. We want the very best outcomes for our patients." Orthodontists are uniquely qualified specialists who diagnose, prevent and treat dental and facial irregularities to correctly align teeth and jaws. Orthodontists receive an additional two to three years of specialized education in orthodontics beyond dental school at an accredited orthodontic residency program. Visit the AAO's websites, mylifemysmile.org and aaoinfo.org, for information about orthodontists, orthodontic care and to locate nearby orthodontists.